If you looked closely at the pictures of our rented house in Monduli Juu, you may have noticed that there’s a solar panel on the roof and a power line tied in on the front porch. The house is on the electrical grid. However, with power available as little as 4 hours a day, that doesn’t help much. We expect that we will depend largely on solar power. Our impromptu system: One panel, a car battery, a controller and an inverter. We experimented with this a bit while we were in Tanzania this year. Lewis Short had a working battery, and we purchased a solar panel and the associated parts. The panel provides 12 volt power any time the sun is shining. The controller manages the power loads so the panel can’t overcharge the battery and the inverter can’t completely drain the battery. The inverter converts the 12 volt DC power into 220 volt power. The extension cord runs through the bedroom window. It was enough to provide power for my CPAP and for charging our electronic devices. This system costs about $150 (plus the cost of the battery). We will need a system about ten times as large as this, to run our appliances and electric lights. The good news is that we can purchase all the parts (except a 110 volt inverter, just in case) locally, supporting local businesses. Just south of the equator, and at an altitude similar to Denver, we get lots of sun! In fact, we have to be careful to wear a hat when we’re outside, pretty much all the time. 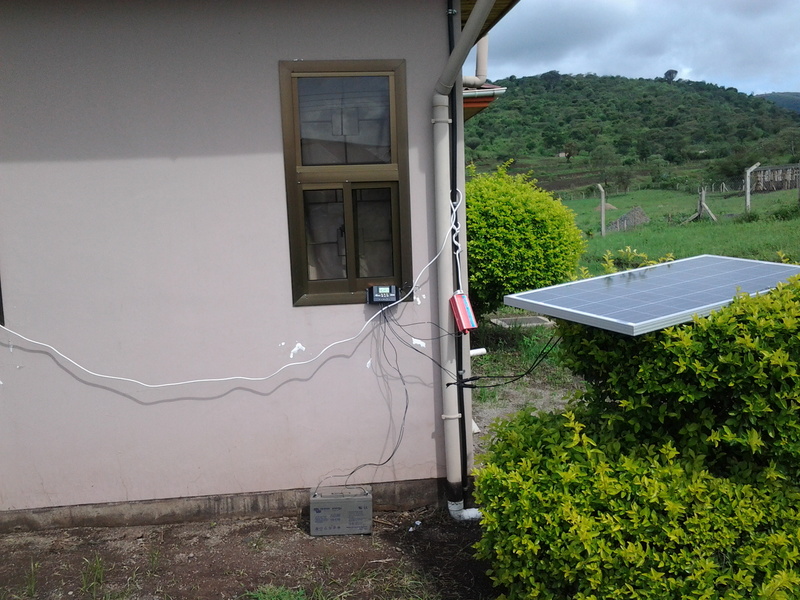 Solar power is a smart way to go. It’s especially smart when you consider this story from the BBC, explaining that Tanzania has just shut down all of its hydro-electric power plants, because of a shortage of water. The already tenuous power supply is now further reduced. That water shortage has much more serious repercussions. If there isn’t enough water to run the turbines, there certainly isn’t enough water for people, or for their animals or their farms & gardens. So while we are installing a solar system for our own needs, we’re looking for ways to help our neighbors meet their need for clean water.